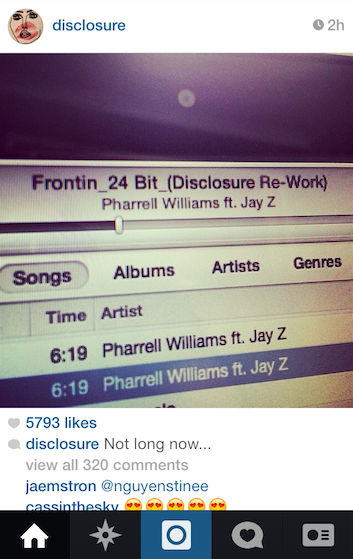 A couple of hours ago, Disclosure instagrammed a photo of their computer screen, on it was iTunes playing a track titled Frontin_24 Bit_(Disclosure Re-Work) by [of course], Pharrell & JAY Z. An already classic anthem courtesy of Skateboard P, it can’t hurt to have the British electro duo have a crack at it. The caption of the post was ‘Not long now…’ Let’s hope so, because I for one can’t wait to hear their spin on the Pharrell joint, continue following The West Review for the latest updates on this release, as well as many others.